The Road to Publication. Okay. Daunting topic. What did I get myself into? Months ago, when I signed up to write a post on this theme, my launch day, June 14, still seemed so far away and abstract. Back then, I imagined that the day before Tokyo Heist was released into the world, I'd be writing from a place of great insight and emotion and that the words would come easily. To my surprise, I've had a massive case of writer's block on the subject. Marking out start and end points? Not easy. Did my road to publication begin with the first scenes I wrote of what would become Tokyo Heist back in 2004? Or did it begin at age five, when I was a self-publishing industry long before Amazon, churning out handmade books with titles like Eat Your Fruits and Vegetables and foisting them upon anyone who crossed my path? Or did it begin when I left an academic career to pursue creative writing full-on? I'm near the end of the road to publication now, at the last water stop before the finish line. Or is there a finish line? Am I ending a journey or beginning a new one? Am I just going around a bend in a very long road? 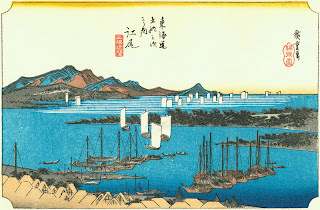 Because I could stand here philosophizing about this forever, I'm enlisting the help of a traveler you may or may not have heard of: Hiroshige Utagawa, a Japanese woodblock print artist from the 1800s. (I know; summer's beginning, and I'm giving an art history lecture. Stay with me. I'll be brief). 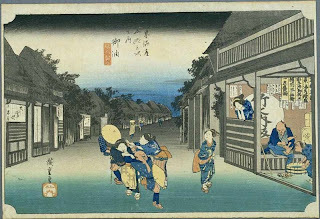 The Tokaido Road was the main highway in old Japan, linking Edo (before it was called Tokyo) to Kyoto, which was the capital. Hiroshige traveled along this road in 1832. Inspired by what he saw, he sketched madly along the way and later created what would become his most famous series of landscape prints: "The Fifty-Three Stations of Tokaido." The "stations" were places where travelers could find food, stables, and lodging. Hiroshige's 55 prints were a huge publishing success in the highly commercial business of ukiyo-e prints. They established him as the most prominent printmaker of his time. The prints became sought after in Western countries, and Vincent van Gogh was one artist who was profoundly influenced by them. In fact, this is a connection my characters learn of and explore in Tokyo Heist. I love the Tokaido Road series too, and at times along the journey of writing and publishing Tokyo Heist, I've looked back at those images, imaging myself trekking across those vast landscapes. They seem alternately barren and lush, inviting and hostile. I'm going to highlight a few stations from my journey with Hiroshige's help. I think some of his snapshots from the road could be mine too. Station 1: Writing. You start a book. You research start over, research, start over, searching for your real story. You strive to finish a complete draft before having a baby, and type "the end" hours before going into labor. Months after baby is born, when brain cells return, you start revising again, sorting out characters and untangling plot lines. Panicking over the amount of money shelled out to babysitters, you realize this isn't a joke, and it isn't a hobby, and the dream must become a goal. You try to edit a 500-page manuscript down to something reasonable that you can try to get published. Station 2: Querying Agents. Look at all those pretty query letters and sample pages embarking on perilous journeys! Some will never make it out of the harbor. Some will go out to sea and never be heard from again. Some will return with boatloads of hope as partials and fulls are requested. You take the manuscript off the market, revise again, query again. In April 2010, one of these queries, from this first new fleet, will reach the shore of the perfect agent. Station 3: Getting a Book Deal. This is the beginning of learning to give up some control. You may be in the boat as the manuscript goes to market, but you are not the one steering it. And after coming from Station 1 and 2, that is a relief; you sit back for awhile, you trail your hand in the water. Then you cheer and dance on the opposite shore in July 2010 as the agent sells the book, quickly, to Viking/Penguin, the perfect match. Station 4: Waiting/Revising. Waiting for edit letter, contract, etc. Riding out some uncertainty as the acquiring editor leaves the house and new editors are assigned. Edit letter arrives. Revising begins -- and then a massive earthquake and tsunami hit Japan in March 2011, just as you're about to rework the Japan scenes. You revise again after temporary paralysis and crisis of faith. You revise all summer, even while on a Cape Cod vacation, while your family plays on the beach without you. Line editing and copyediting follow. Station 5: Finding Community. Going to conferences. Even speaking at them. Participating in writer's groups and getting to know fellow writers, like the incredible Apocalypsies. Starting up a mystery writing blog. Making new friends. Going to writer friends' book launches and events. Realizing there is help and companionship to be found and you are not a solo traveler. Some people even have maps. And trail mix. And they're willing to share. Station 6: Venturing into Promotion. Weathering GoodReads. Putting your book and yourself out there -- and then realizing you're in it with fellow writers, book bloggers, early readers, your publishing team, and you are not really alone. And when less-than-ideal reviews or ratings hit, you can choose to put up your umbrella and ignore them and forge ahead. Station 7: Celebrating Publication Day. The clouds part. A pleasing vista appears -- the book is on store shelves! Some people are reading and reviewing the book -- and liking it! You've arrived -- maybe not at the end of the journey, but somewhere different, somewhere new. A book party awaits. There will be old and new friends to celebrate with, and hopefully -- the real dream -- readers to respond the book. Just think! Your words will travel down roads you've never been and reach people you've never met. Your words may travel more, and farther, than you ever will. 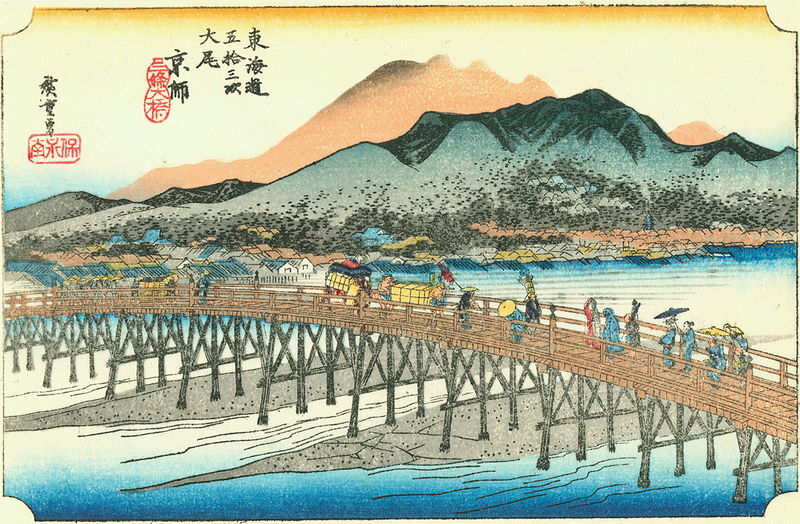 When I scrolled through Hiroshige's 55 images this time around, it was really the images with people that drew me in, even though he's primarily a landscape artist. The road to publication is an endurance event, and may have its solitary stretches, but there are stations and fellow travelers to be found. I'm trying to change the language I use to describe the journey. I catch myself using words like endure and survive. But the road to publication can also be enjoyed and celebrated and savored. You can stop every so often and take a good look around. Many people along the way have helped me get to where I am as a published author. Just as importantly, many people have reminded me to pause and enjoy the views. 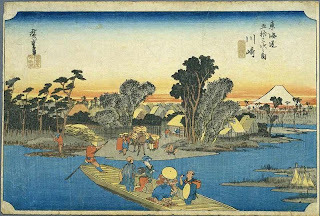 Thank you, Apocalypsies, book bloggers, beta readers, crit group partners, publishing team, family, and friends, who have offered help, companionship, and respite on my own Tokaido Road. Diana Renn's debut novel, Tokyo Heist (Viking/Penguin) releases Thursday, June 14, 2012. It's about a teenage girl who loves manga and who stumbles into an international art mystery in Japan. View the Tokyo Heist book trailer at YA Books Central.